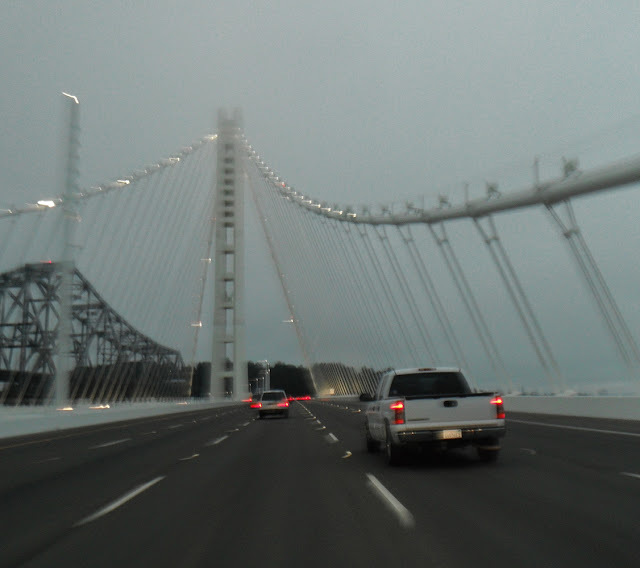 I wanted to post a photo of the newly opened East Bay Skyway (34 0007L/R), which is part of the San Francisco Oakland Bay Bridge. Unfortunately, going 60 mph in the early morning light didn't provide the ideal conditions for photography. The photo is of the self-anchored suspension spans at the west end of the East Bay Section of the Bay Bridge next to Yerba Buena Island. The tower is made up of four steel legs, tied together with shear links, which are designed to yield and protect the tower during earthquakes. We are on our way to Japan for a week and I'm hoping to send some blogs about bridges across the Edogawa. Alameda County, California Bridges: East Bay Skyway Bridge across San Francisco Bay (1) by Mark Yashinsky is licensed under a Creative Commons Attribution-NonCommercial-NoDerivs 3.0 Unported License.